This weeks Aussie Curves challenge was '$50 Outfit'. Surprisingly this was extremely hard for me. Harder even that vulnerable week (which was confronting) or feminine week (which was not my style). For the past week I've been staring into my wardrobe at a complete loss! It's not that I buy a lot of expensive clothes but I buy a lot of mid range separates that even if below $50 do not a complete outfit make. As someone who doesn't wear a lot of dresses it also meant I needed more cheaper pieces than if I just chucked on a single dress. I don't consider myself a very good thrifter, mainly because I have no patience for rack sifting looking for the 0.00001% of vintage things that'll actually fit! 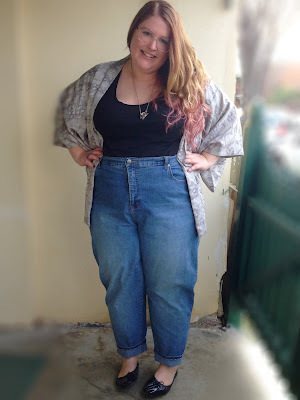 But looking back at my posts I've actually shown a few thrifted items! In particular my 2nd work outfit which showcased 2 thrifts (and happened to be under $50 but alas I've already used it!). 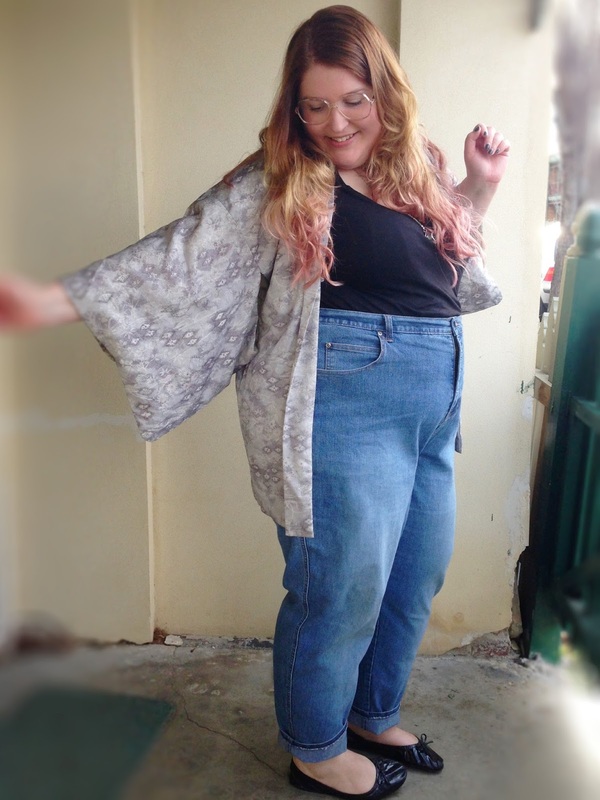 When I got that kimono shrug I also got this one. Massive score! 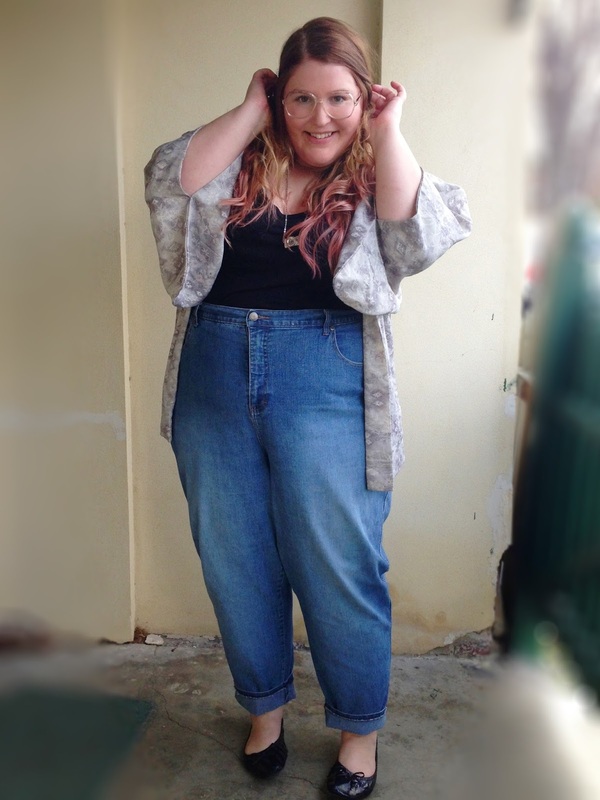 A couple of months ago I was OBSESSED with finding the perfect light wash super high waisted retro jeans. This pair is one of the many I picked up in that time that doesn't quite meet the mark (if only they were tighter in the legs!). But for $5 they're a steal and are really versatile. 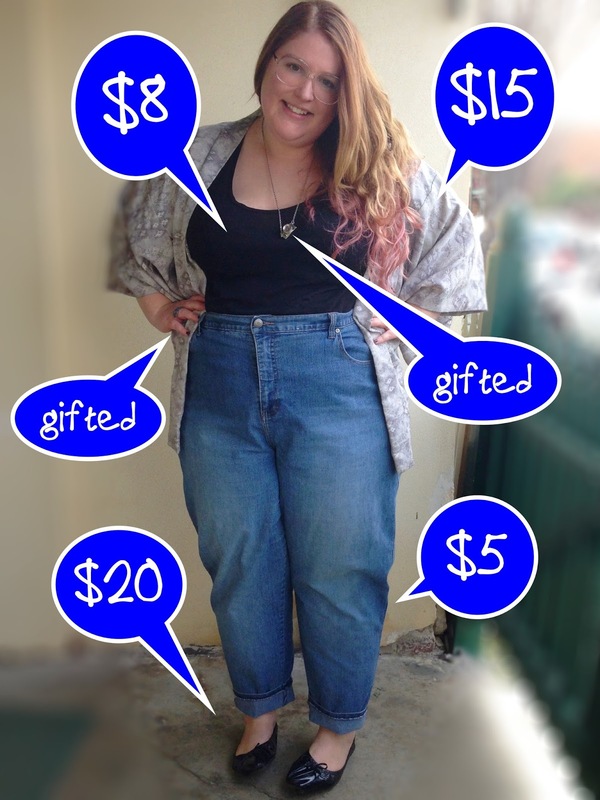 I wish my whole outfit could've been under $50 but I just couldn't do it as much as I tried! So my credit card and phone are in the back pocket and my jewellery was gifted. However at least that's realistic for me as the majority of my jewellery has been given to me and a lot of the time I can't be stuffed carrying a bag (hence why you rarely see me with one on the blog!). My advice to dressing cheap? 1) If you've got the time search those op shop racks for a bargain. 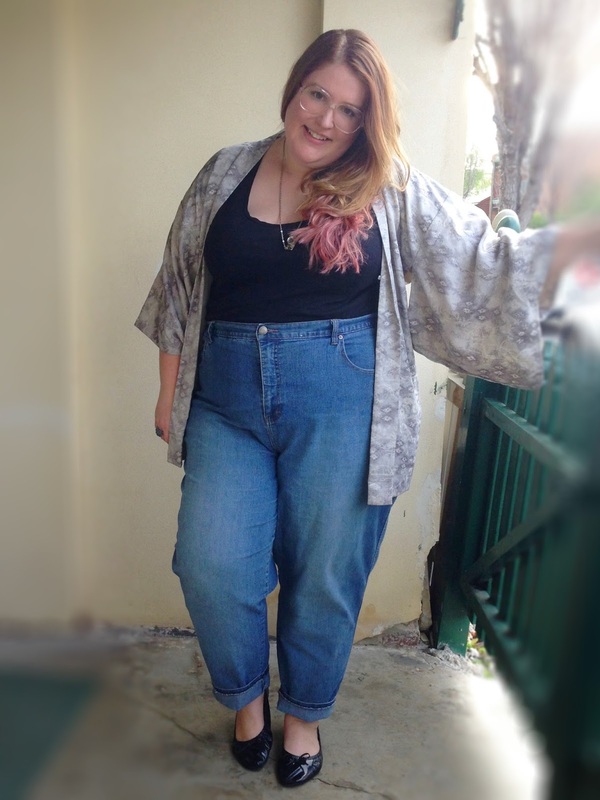 And don't limit yourself to one size; my kimonos and shrugs are all straight sizes but work for me. 2) Shop the sales!! 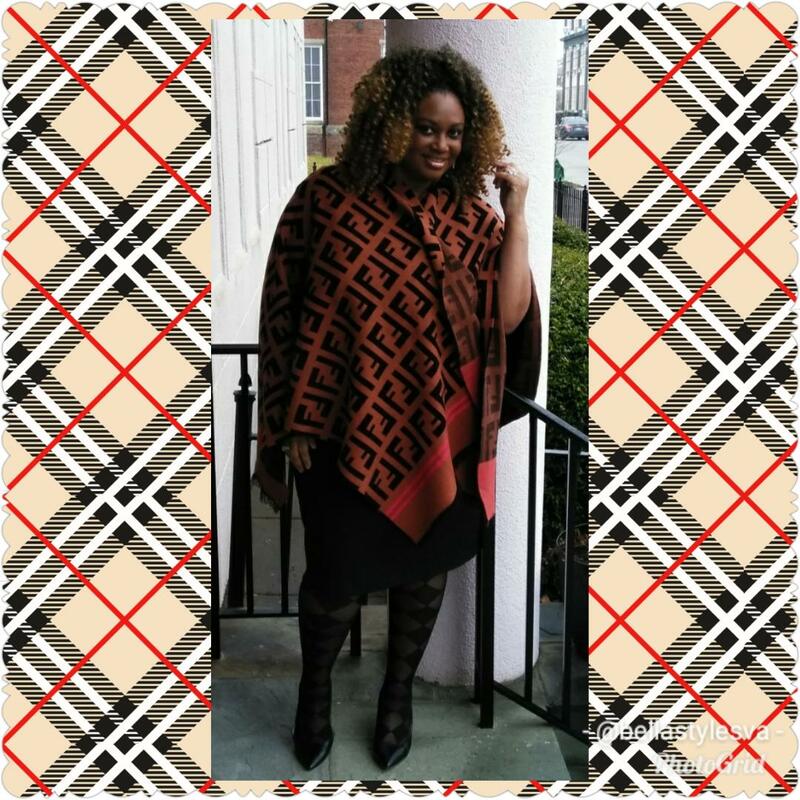 It might mean buying out of season but you'll build up your wardrobe with quality pieces for pennies. 3) Try stores you'd sometimes ignore. Target, Kmart and BigW might seem a little too "convenience store" to you but you'll find great, CHEAP basics and sometimes the odd gem. 4) When forking out for pricier pieces pair with cheap items to save money on the outfit as a whole. 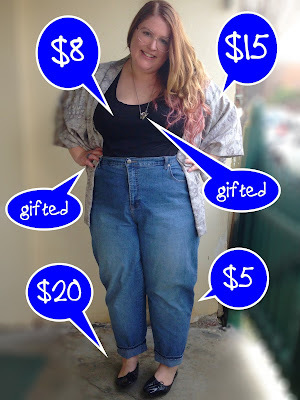 How do you look good on the cheap? You look so cute! Love the ombre hair. 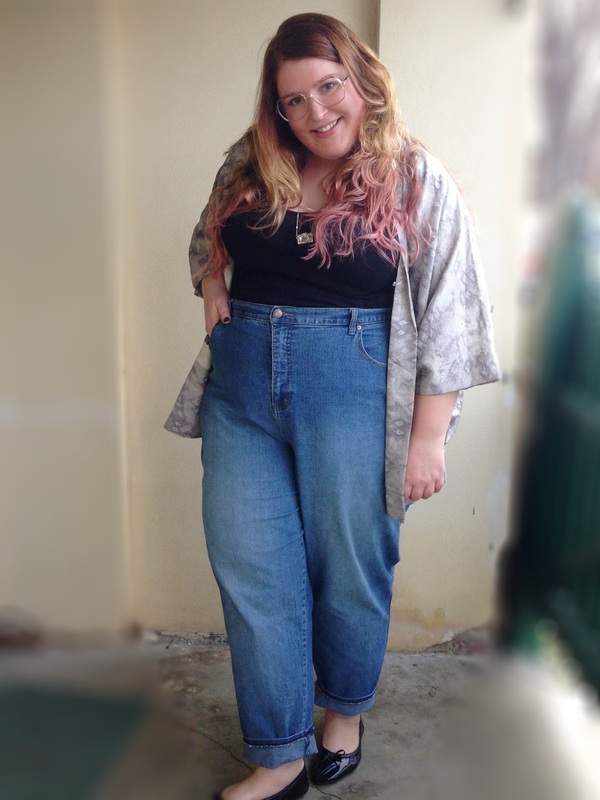 Love this outfit, score on the $5 jeans!love the pink tips! Great post! Loving this as an outfit. The jacket just makes it. Beautiful. You outfit is great but I loooove your hair. Please contact me any time with questions, comments and suggestions! 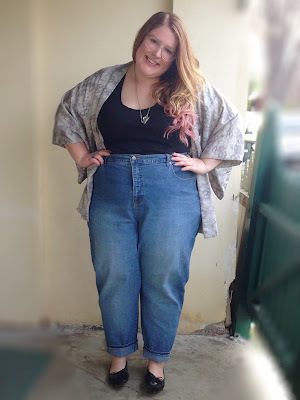 Fat Girls Like Nice Clothes Too! 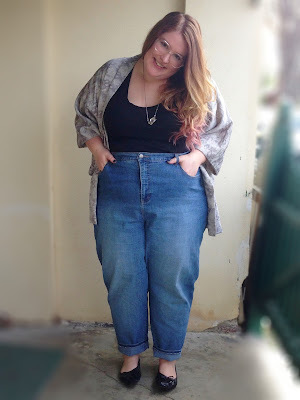 Pocket Rocket Fashion - fat, but not unfashionable! Dressing like a 5 year old? Sign me up!